Dashcam Viewer v2.1.7 was released today with the following new features and bug fixes. Dashcam Viewer is available for Mac OS X and Windows (64-bit and 32-bit). Download the free version from our website. [Mac version] The graph and map will now update after clicking on the seek slider widget when the video is paused. Previously, the update would not occur until video playback was resumed. Exported PNG captures are now saved to the Desktop using the following filename convention: movieName_lat,lon@movieTime.png. Thus the latitude and longitude of the vehicle is recorded in the filename of the PNG. Dashcam Viewer v2.1.6 was released today with the following new feature and bug fixes. Dashcam Viewer is available for Mac OS X and Windows (64-bit and 32-bit). Download the free version from our website. Added progress dialog when exporting movie fragment or merging movies. Previously no measure of progress was displayed. Merging of movies or exporting clips from two-channel camera can be very time-consuming. [Windows version] The graph and map will now update after clicking on the seek slider widget when the video is paused. Previously, the update would not occur until video playback was resumed. Fixed bug that would prevent audio from being transferred when exporting a movie clip in some cases. Dashcam Viewer v2.1.5 was released today the following new features. Dashcam Viewer is available for Mac OS X and Windows (64-bit and 32-bit). Download the free version from our website. Windows users can now merge multiple movies into one movie using the Merge tool. To use the tool, click the toolbar icon with the right-hand arrow inside of a filmstrip. This feature had previously only been available in the Mac version. 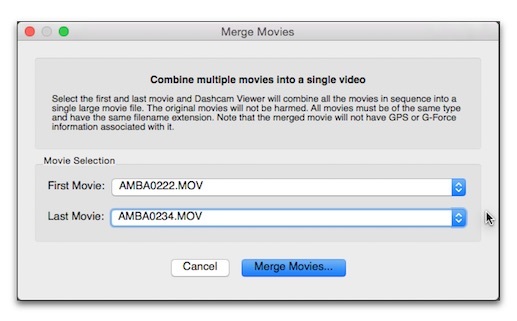 [Mac version] When exporting a movie fragment from a dual-channel camera, Dashcam Viewer will produce a Picture-In-Picture movie with the rear camera view in the top left corner.